Viruses always seem to find streamlined ways of doing things. Their enzymes are often multifunctional and more compact than their cellular counterparts, and overlapping genes allow them to pack a lot of genetic information into a small space. They have also found a very parsimonious way of creating membrane channels. These simple channels, termed viroporins, are stripped to the bare minimum, with just enough molecular machinery to perform their membrane-spanning function. The p7 protein of the hepatitis C virus, shown here from PDB entry 2m6x, is a perfect example. PSI researchers at MPSbyNMR have recently solved the structure of the channel using NMR spectroscopy. 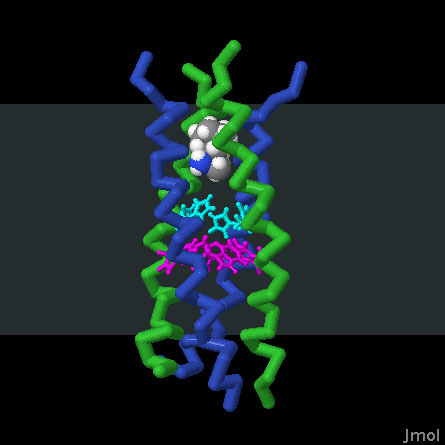 The structure reveals a compact funnel-shaped pore composed of six identical chains, each only 63 amino acids long. The funnel constricts down to a ring of asparagine amino acids, which together form a selectivity ring that may favor the passage of calcium ions over other ions like sodium or potassium. Viroporins are essential for efficient infectivity, but their exact functional roles are still a subject of study and debate. They may be important for disrupting the normal ion balance of the cell, especially as new viruses are exiting from the infected cell. They may also be important for allowing passage of ions into and out of the virus, so that it can sense when it is inside a cell and ready to release its genome. In addition, they often also act as scaffolds, interacting with other cellular and viral proteins and holding them near to the membrane. All of these hypotheses are the subject of current research, to try to uncover the varied roles these viroporins are playing in different viruses. Membrane-spanning channels have been discovered in many viruses. Three examples are shown here. The hepatitis C p7 channel is shown at the bottom, composed of six identical chains. Two even more compact proteins are shown at the top. 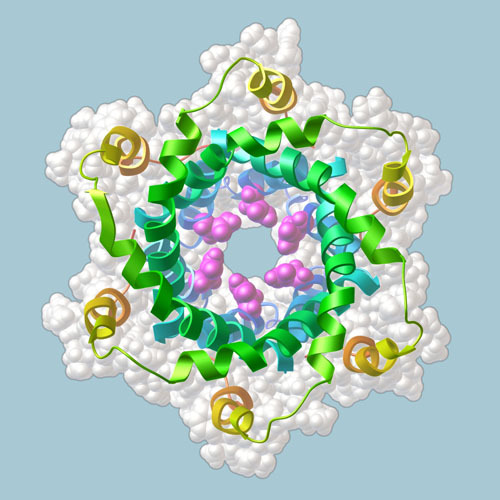 The M2 protein of influenza (PDB entry 2rlf) is composed of four identical chains, each forming a single alpha helix that passes through the membrane. It is selective for the passage of protons through the membrane. The membrane-spanning portion of Vpu from HIV-1 (PDB entry 1pi7) is composed of five identical chains, and forms a weakly-selective ion pore. OuYang, B. & Chou, J. J. The minimalist architectures of viroporins and their therapeutic implications. Biochim. Biophys. Acta (2013) http://dx.doi.org/10.1016/j.bbamem.2013.09.004. OuYang, B., et al. 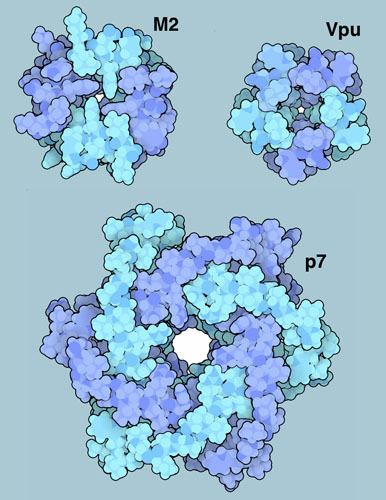 Unusual architecture of the p7 channel from hepatitis C virus. Nature 498, 521-525. Nieva, J. L., Madan, V. & Carrasco, L. Viroporins: structure and biological functions. Nature Rev. Microbio. 10, 563-574 (2012). Pielak, R. M., Oxenoid, K. & Chou, J. J. Structural investigation of rimantadine inhibition of the AM2-BM2 chimera channel of influenza viruses. Structure 19, 1655- 1663 (2011). Schnell, J. R. & Chou, J. J. Structure and mechanism of the M2 proton channel of influenza A virus. Nature 451, 591-595 (2008). Park, S. H. et al. Structure of the channel-forming trans-membrane domain of the virus protein "u" (Vpu) from HIV-1. J. Mol. Biol. 333, 409-424 (2003).